So, today’s post is designed to give you that motivation — no matter what your goal in life is and no matter what your personal challenges might be — by learning more about those who have succeeded in the face of remarkable odds. You can learn a lot from these 5 stories of people with physical disabilities who rose to the top of their chosen professions by adapting to their environment and never giving up. Consider their stories, apply them to your own life, and perhaps you can turn your difficulties into a story of success. As a young girl in growing up in Coyoacán, a village on the outskirts of Mexico City, Frida dreamed of being a doctor — and then it happened. When a wooden bus she was riding home from school collided with a streetcar, an iron handrail impaled her through her pelvis, fracturing the bone and displacing three vertebrae. In one instant, her dreams of being a doctor were gone. Despite her physical disabilities, Frida Kahlo became one of the world’s most beloved artists. But in a lifetime full of extraordinary effort and determination, Frida found her calling. Combining her interest in science and art, she began learning and practicing the art of medical illustration. After studying the works of European Renaissance artists, Frida’s paintings allowed her to explore questions of identity and existence. For the rest of her life, Frida traveled the world on the recognition of her artistic talents. Some of her favorites were self-portraits in her wheelchair. Her works of surrealism were described as a ‘ribbon around a bomb’. Frida survived her injuries — including battles with an amputation and bronchopneumonia in her later years — to become one of the world’s most beloved artists. For kids that grew up on superheroes and comic books, Superman was as big and brave and strong as they came. ‘Faster than a speeding bullet and more powerful than a locomotive’, generations pinned a towel around their necks into a cape and dreamed of having his powers. And for kids that grew up in the 80s, American actor Christopher Reeve was the Superman that captured our imaginations. Overcoming physical disabilities made Christopher Reeve a real-life Superman to millions of fans. Christopher’s epic battle began in 1985 when, training for a part in a new movie, he was thrown from his horse. He landed on his head, shattering his first and second vertebrae in a cervical spinal injury which paralyzed him from the neck down. Not only would he never walk again, but he would never regain the ability to move any part of his body. Before his death in 2004, Christopher Reeve became an inspiration — a real-life Superman, some would say — for persons with physical disabilities worldwide. When a 2003 shark attack left her without a left arm, many family, friends, and fans thought that Brittany Hamilton’s promising professional surfing career had surely come to and end. But, Brittany had other plans. One massive return to competition surfing, an electric autobiography, and a feature film later, her popularity has never been higher. Hamilton was 13 when a tiger shark severed her arm just below the shoulder — resulting in 60% blood loss and hypovolemic shock. After an extensive operation and four weeks of grueling rehab, she was back on her surfboard one month after the attack. 2009 contestant on Are You Smarter than a Fifth Grader? Hamilton showed that no matter how old or young you are, comebacks from devastating injuries are entirely possible. Afflicted with cerebral palsy — a neurological disorder that leaves victims almost entirely spastic in the limbs — the parents of Irish writer and painter Christy Brown were urged to commit him to a hospital for the rest of his life. Instead, they were determined to raise him at home with their other children — and, to give Brown the best chance at living a normal life. This young man responded in remarkable ways — maturing into a serious artist with almost no formal training. Following his keen interest in literature and the arts, Christy began channeling his talents through his left foot — the only part of his body over which he had complete control. With the assistance of a noted author and teacher at his school, Dr. Robert Collis, Christy wrote My Left Foot — an autobiographical account of his daily struggles. The book became a sensation, and Brown became a prominent celebrity and public speaker. He continued to live a life inspired — painting and writing poetry, plays and a final novel. He passed away as one of Dublin’s most prominent literary legacies. Tetra-amelia syndrome is a rare disorder characterized by the absence of arms and legs. There are only seven known surviving people on Earth with this affliction. One of them, Australian-born evangelist and motivational speaker Nick Vujicic, has shown the world that anything is possible — even if you don’t have arms and legs. Celebrities with physical disabilities like Nick Vujicic have inspired millions to keep living their best lives. This is truly a story for the ages. Despite his mother’s refusal to hold him at birth, constant bullying throughout his school years, and an attempted suicide, Nick lived what he refers to as an ‘amazingly normal childhood’. He graduated from Griffith University with a double major in accounting and financial planning. Nick continues to motivate and inspire individuals and organizations with his faith-based message of developing a never-say-die determination and cultivating the will to win. The bottom line? Everyone starts from a different place and faces different challenges — and, you never know when your big break might come. But, if you stay the course and give it everything you have, real success — however you might measure it — could be just around the corner. If mobility freedom is preventing you from living your very best life, the team at AMS Vans can help. 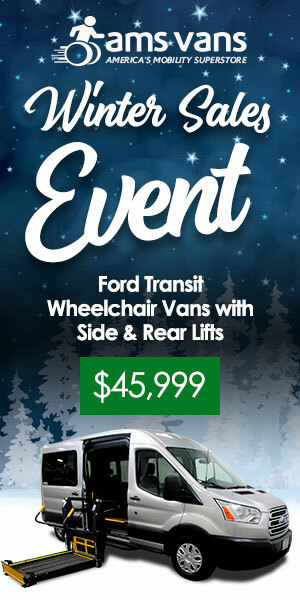 We offer a robust selection of new and used wheelchair accessible vans at unbeatable prices with adaptable van financing options that could make mobility freedom a lot closer than you realize. This entry was posted in Advocacy, Cerebral Palsy, In the News, Opinion and Discussion, Paralysis, Spinal Cord Injury on December 26, 2017 by AMSVans.